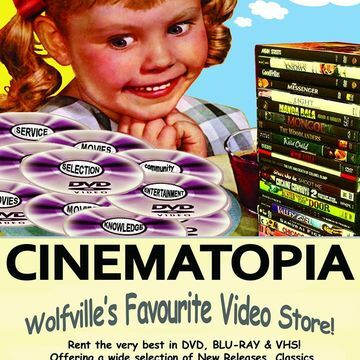 Let's Save Cinematopia- Nova Scotia's video store! Megan Haliburton hasn't added a story. My name is Megan Haliburton and I own one of the last independent video shops in Nova Scotia, Cinematopia Video. With the advance of technology came a change in the way many people satisfy their movie watching needs, but for many movie lovers, the video store experience is a valuable resourse which should not to be lost in the tide of time. An actual place where cinephiles come to absorb the atmosphere, browse a doozy of a DVD collection, and take advantage of the knowledge and contageous film-love of our dedicated "staff". Please help save something extremely precious: an archive of the best films from anywhere at any time, and your own access to this collection. Megan Haliburton hasn't posted any updates yet. Donate $20 or more and have unlimited open access to our DVD archive, excluding new releases. Take 4 at a time, come back again and again until that month is up, then donate again! Mail-out available for $25 and over. Megan Haliburton is managing the funds for this campaign. The campaign is for a personal cause.